Beautiful baby girls set arrives with matching jumper, trousers and sweet little bonnet to keep her head warm. 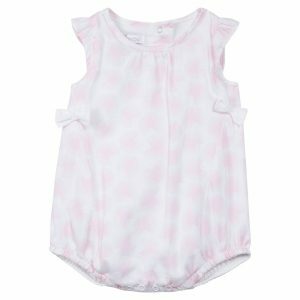 Baby Girls Pink 3 Piece Set has pretty knitted detail on the front of the jumper. This set arrives with long sleeve jumper, covered feet trousers and sweet little bonnet. The top has long sleeves and traditional Peter Pan collar with delicate pink embroidery on the trim. There is a small satin bow on one side and the trims are in white. The knitted trousers have covered feet to help keep her little toes warm and elasticated waistline for fit and comfort. The bonnet has one button fastening on one side. Adorable baby girls knitted set for her to wear. This girlie outfit would also make a super choice for a gift to give a baby girl. 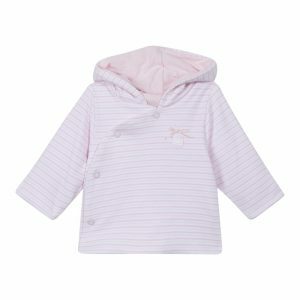 Please click the link to browse more baby girl clothes or baby girls sets online at bumpalumpa.com.